My name is Rhonda K. Gatlin and I have always considered myself a southerner even after I left the south. I was born in Tampa, Florida, attended high school in Montgomery, Alabama, received my Bachelor of Science from Auburn University and in later years my Masters of Literary Arts from Leslie College in Las Vegas, Nevada. I taught elementary school in the south for fourteen years then moved out west to Boulder City, Nevada, in 1989, where my husband and I live. I taught second graders for an additional twenty-five years in Boulder City’s Andrew J. Mitchell elementary school. Aggie’s Purple Hands is based on an experience in my childhood while visiting my granny and papa in Hartford, Alabama, during the summers. Aggie is named after my granny instead of using my name. I am now old enough to learn how to make scuppernong jelly, but making jelly is hard work. There are lessons to be learned using cups, pints, and quarts. Grapes to be mashed and I have to scrape out the grape hulls after the grapes have cooked down for making the jelly. Soon I notice that I have purple hands and I am in tears. “I don’t want purple hands I cried!” As you read the story you will find out who is the hero in my story. The book is available in both Hardcover and Kindle versions on Amazon HERE. I love teaching and reading to children. There are so many sci-fi and fantasy books that I wanted to write a story about a wholesome family that children and parents could relate to by sharing their own memories. Aggie’s Purple Hands is set around an extended family Momma, Daddy, Aggie, Roger, Granny, and Papa; throughout the story, it shows a ”Legacy of Love”. This projects, the love of family and the way they work and play together. Rhonda has done several readings here in town and elsewhere. Currently, this coming Saturday, March 2nd she’ll be appearing at Copper Cat Books (1570 West Horizon Ridge, Henderson) from 11am – 2pm. See more HERE. Bring the kids or grand kids, and enjoy a live reading and book signing! The story Aggie’s Purple Hands is set in the early 1960s and the book shows how families played and worked together. It is a delightful story showing how children use their imaginations through playing pirates under the scuppernong grapevine arbor. It teaches the making of scuppernong jelly. This cooking process can be used with any kind of fruit to make jelly and it incorporates correct measuring utensils. The most important message I want to relay is reading is the window to learning new information, using your imagination and reading for pleasure. I talked on the phone to a sales rep from Publishers Weekly to find out about marketing for my first book Granny’s Cobbler: a Counting Book. (Also on Amazon) was doing my first reading and signing at Barns and Noble that next weekend. He came and heard me read. He said, “I watched how the children were spellbound as you read”. He asked if he could take my book with him to the New York’s big Book Fair. He was leaving the next morning for New York. While he was there he introduced several people to my book. Mascot Books was one of them. They emailed me and I chose their company. It took about a year to complete my second book with cover, illustrations, and the story. Aggie’s Purple Hands was released September 4th, 2018. The first experience I had with writing was in fourth grade. I entered a writing contest my story was called “When I Give My Dog a Bath”. I won first place in our school. After that, I was always writing little stories mostly about all the different places we moved. Daddy’s job took us all over the southern states. Writing continued to be part of my life when I became a teacher. I taught elementary students how to use their own experiences to write their stories. When you write what you know about the subject can be developed so your characters have more depth. You can use descriptions to paint a picture with words. I retired after teaching thirty-nine years. I finally took the time to begin writing for myself. I used the same philosophy to write my stories as well. I took experiences from my childhood and shared the events. Did you take any formal or informal classes or seminars in writing? Yes. I continued taking classes to improve my skills in teaching writing to my students. I wanted them to have a better understanding of how to write. It is important for young students to begin using topic sentences, writing descriptive paragraphs and in doing so; I learned to hone my skills as a writer. To start writing you need a hook something that will catch your readers to want to continue reading. When writing you need to know your target audience. When thinking through your story line, make sure to use words that ‘show’ not ‘tell’. Using strong verbs, for example: “The dinosaur was as tall as a sixth story building.” Instead of: “The dinosaur was tall.” Know what your main idea is even if you aren’t sure of the direction your character(s) will go. Make sure the protagonist (the main character) is the one that is liked and has good qualities, and the antagonist (the one that causes conflict) in the story usually is at odds with the main character. A good story has a conflict, situation or some type of challenge and at the end of the story a conclusion or resolution. I have lived in Boulder City for 30 years. It is the first place in my life that I have been able to set down roots and become a part of the community. I taught for twenty-five years at the same school right here in town. I enjoy running into past students and parents. I love Boulder City. 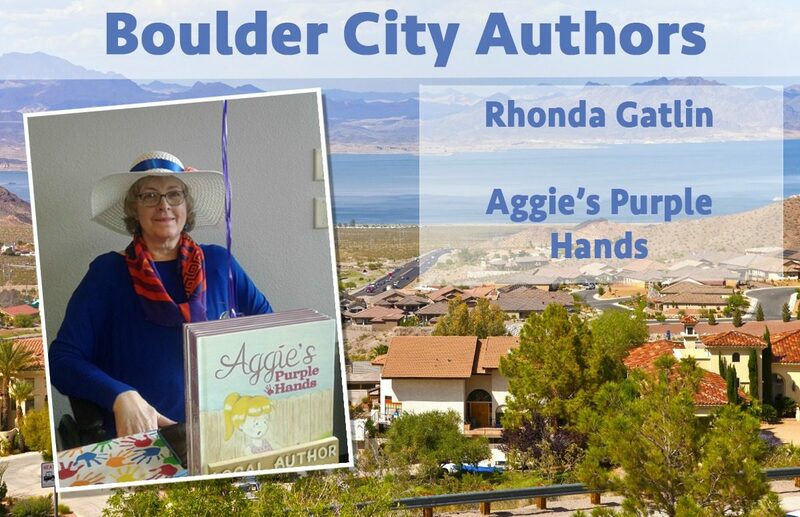 I received an award the American Graduate Champion in 2016, from Las Vegas Public Broadcasting System (PBS) and recently I was reviewed by OnlineBookClub.org I received a 4 out of 4 rating for Aggie’s Purple Hands.